Although the temperature has not yet been too spring-like, the woods are bursting with new green growth so I have to assume that warm days will be here soon. If you doubted the arrival of spring, you should see the area beyond the Icky-Water Bridge. The stream is flowing high through a plush green carpet of skunk cabbage and the bright yellow flowers of marsh marigolds. It is an undeniable sign of spring on Columbia Lake. Last Saturday, Asto Wamah was fortunate to have about 40 hard working volunteers (including 5 staff member!) rake mountains of leaves, clean the winter debris from each cabin and building, wash all the dishes and pots and pans - all in an effort to make sure camp is ready and welcoming for this new season. On Saturday, May 26th from 3:00 to 5:00 we will be holding our annual Open Camp Day where new Asto Wamah families come to visit camp. Present and former staff and LTs take groups on tours and explain our program and answer questions as they walk. There are refreshments in the Lodge where people gather to learn more about CAW. Everyone is invited! Hope you can be a part of this enthusiastic group. For the next 7 weeks we will be holding several trainings for our staff to make sure everyone is prepared and qualified for the amazing and challenging job ahead. Additionally, delivery trucks arrive daily with equipment/supplies we will use in programming and throughout each camp day. Plans are being made for some new and engaging activities. Nature will be front and center - fun along with instructive. Hope you will be a part of this, our 109th season! Hope the start of spring finds you all well and excited to welcome in the new season. It surely means that Asto Wamah is getting nearer which is a wonderful thing! March was a difficult month at camp. The wind took down a good number of large branches and many small twigs. Cleaning up the woods has taken a lot of time and effort but we are not complaining because there was no damage to buildings, docks etc. Now with the arrival of warmer temperatures and with most of the snow melted we are gearing up to turn on the water and get the facility up and running. April is the month when lots of cleaning and sprucing up takes place. On Saturday, April 28th from 9 to noon we have our annual Work Day where leaves are raked and removed, cabins are cleaned, the bathrooms are readied for use and the infirmary and Hungerford are opened and organized. We usually have lots of help and by noon the place looks awesome. It you would like to come and help we would be delighted. There are all kinds of tasks that need willing workers. Everything is completed by 12:00 at which time lunch is served. Call or email me to let me know that you are coming so we have plenty of food. As I indicated in March, 2018’s registration has been like none from the past. Each session filled in record-breaking time and all the waiting lists are LONG. I attribute this success to all of you (and your mothers) who have been spreading the word about the value of an Asto Wamah experience. We are very appreciative of the excitement your ‘word of mouth’ has generated. Thank you! Last month I reminded you about Open Camp Day that will be held on May 26th from 3 to 5. This is a wonderful time for first year campers to see the campsite and learn about our program and activities. Staff and old campers will be present to give tours and meet new camp families. If you know a first year campers that might be interested in visiting on the 26th please let them know. Everyone is welcomed. During April we continue to make programming decisions. We’d like to focus on healthful choices for maintaining wellness. Our plan is to have a yoga instructor and a marshal arts instructor offer opportunities to campers and staff. We hope to have our Basketball/Newcomb Ball court replaced by the time of your arrival. It will be nice to have one without cracks! Wishing you a great month ahead as we get closer to the 2018 camping season. Thought you’d like a visual update on the state of Asto Wamah after the three recent storms. This was taken at dawn on the 14th. Absolutely BEAUTIFUL! Thank you for tuning in to get the monthly update! February has always been a hectic month at camp with the opening of registration for the new season. This year however broke all records. For the first time ever we went to an online registration. Within 4 days, 160 campers had registered! By the end of the month all sessions were close to being full and some have a waiting list. I have to admit that I could never have predicted how quickly the registration would go. If you are on a waiting list and would like to know where you stand, please email me and I will attempt to give you an idea of your chances. Every summer we are able to move campers from the waiting list to fully registered. It just takes time and you need to be patient. Staff contracts are soon being sent to 81 individuals who have expressed interest in working at camp this summer. One hundred percent of the staff are returning from last year’s staff or from the 2017 LT program. They will bring with them the enthusiasm and dedication that the CAW staff is famous for. This summer is going to include some new programming ideas specially designed to engage and inform the entire camp community. More on that in future months. I am hopeful that you are healthy, happy and thinking about Asto Wamah and summer fun! P.S. Save the date: May 26, 2018 Open Camp Day! Details to come. We are now entering an exciting time of the year for Asto Wamah. February is when registration begins and we look forward to the return of ‘old’ campers and the anticipation of new campers. Program supplies and equipment are being ordered and new adventures in programming are being planned. 2018 will be an awesome summer! This season’s registration will be done online for the first time in the camp’s history. When you go to the camp’s website (www.campastowamah.org) you will find a link to the 2018 Registration. Hopefully this process will be easy to navigate and less cumbersome than the old paper and pen method. When it comes to health forms, we are hoping that you will be able to successfully download the forms and then return them digitally or you can always send then via Fax (860-327-5618) or mail to Camp Asto Wamah 42 Rt. 87, Columbia, CT 06237. The Exam Record will need to be signed by the pediatrician and cannot be over 2 years old. The Authorization for the Administration of Medication is only required if you are bringing medication(s) to camp with you. The signatures of the prescribing physician and the parent are needed. A new form is needed for each medication brought. The software program will be able to collect these forms digitally and you will be able to check to verify that your forms are all in. We strive to facilitate a smooth check-in process. On arrival day there will be 2 lines – those without medications and those with medications. It is helpful when forms arrive early so issues/problems can be addressed before check-in. For all of you who have told friends and school mates etc. about Asto Wamah THANK YOU! You are our best form of advertisement! P.S. It was a great disappointment to the staff and many campers that the Camp Reunion planned for January 6th had to be cancelled. We have no control over Mother Nature. Hopefully next January’s event will be a go! Happy New Year from Camp Asto Wamah! Wishing you and yours a New Year filled with good friends and family, health and happiness, and time to appreciate it all! This is an exciting time as the camp year is about to officially begin. Within a week, everyone on our mailing list will be receiving our newly formatted ‘brochure’. The brochure looks more like a big postcard and contains only the essential details of the upcoming season. Its purpose is to direct those interested in attending camp to the online registration process (please note: registration does not open until February 1st). We are hoping you will find this modern method easier and less cumbersome than the previous method used for the last 107 years. This process is new and there may be snags. Please be patient and email or call if you have a problem. Plans and preparations for the summer of 2018 are well underway. The old-time favorites will be back along with some exciting additions to the program that we know you will like. Remember: if you haven’t “spread the word”, there is still time. We count on you! Right now, Asto Wamah is in the middle of a deep freeze. I have included two pictures that may surprise you. One is taken from the flagpole and the other gives you a view of what the lake looks like at its winter level. The White Raft rides out the winter in the sailing area so it isn’t broken apart by the moving ice. More pictures will accompany the February Blog. It is just about a week until the Camp Reunion. The date is Saturday, January 6th from 1:00 to 3:00 at Center Church House, 60 Gold Street in Hartford. The Church House is located one block west of the Wadsworth Atheneum and at the edge of Bushnell Park (near the ice skating area). Staff from camp will be on the sidewalk of Gold Street to welcome you. Parking in the area barely exists so we will be vigilant taking you from your parent’s car and returning you back at 3:00. Stay warm and well. Summer is on its way! Welcome to the December Asto Wamah Update! Quite a bit has changed at camp during the past month. 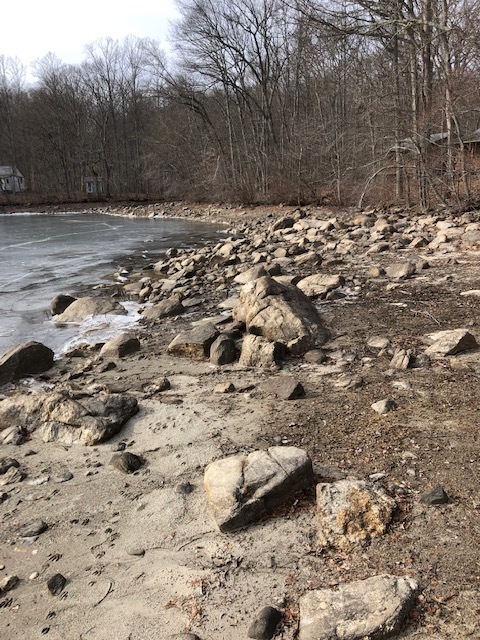 Most noticeably, the lake has been drained to its winter level, which means there is a lot of lakebed that is presently dry. Draining the lake protects docks from ice damage during the winter. This practice also results in a cleaner and clearer lake, making Columbia Lake one of the best in CT! We are continuously working on the D.C., repairing and replacing those parts that are no longer functioning as intended. Tree thinning and clean up is never-ending in this environment and the unusually good weather has been helpful. Outdoor work is a priority as we try to beat the snow that can restrict our ability to complete certain projects. We have also been focused on working with UltraCamp, a software company that will help us manage registration in 2018. Those individuals on our mailing list will be receiving the newly designed 2018 brochure/postcard in early January; information on the registration process will be included. As always, registration will follow our first come, first served policy. We hope that parents will find this online method much easier. Do not hesitate to contact us at 860-649-8614 if you have any questions. We are hoping to see many of you on Saturday, January 6th at the Camp Reunion! It is a great time to reconnect with summer friends, play games, have dessert, and enjoy time together. The Reunion will be held at Center Church House, 60 Gold Street, Hartford, CT from 1:00 to 3:00 pm. The Church House is a block from Main Street and is located between Bushnell Park and the Wadsworth Atheneum. A familiar face will greet you at the curb (so parents don’t have to find a parking space) and see you into the building. Gold Street underwent major changes in the past year and there are now only about 7 parking spots. On-street parking in the surrounding area is free for those wanting to stay until 3:00. Most parents do not attend the Reunion but you may join if you would like. At the end of the reunion, we will make sure your child connects with you outside. Watch for an invitation via email within the next few days. Don’t forget to RSVP! The mailing list for 2018 is growing. This is the best time to send addresses for friends, relatives, schoolmates, and anyone else who may be interested in attending camp this summer. Remember: we count on you to spread the word!! Hope October was a terrific month for you! I trust you have found the photos from this past summer that are now posted on the website in the Photo Gallery. Hope they remind you of the fun you had and the friends you made! November has arrived quickly in Columbia. Leaves are covering the paths and filling the Gaga Pit. They are not as colorful as they have been in the past, but they do make a lovely ground cover. On Nov. 1st, the dam on Columbia Lake will be opened starting the 2-week process of draining the lake down 6-8 feet. Once it is at its winter low, the aquarium will be dry and you will almost be able to walk around the front of the main dock. I will send pictures with the December Blog. The 2018 registration fee of $50 is due at the time of registration and it is not refundable or deductible from the camp fee of $495 per week. We are hoping that a session at CAW will fit into your summer schedule. The 2018 Brochure will be mailed on January 1, 2018 and registration will be opened on February 1. Last year’s Camp Reunion had to be cancelled because of snow. We will try again this year on January 6th from 1:00 to 3:00 at Center Church House (60 Gold Street) in Hartford. Hope you can attend! An invitation will be sent to each camp household in Dec. via email. Please save the date!! Remember, as you ‘spread the word” about Asto Wamah to friends, relatives, siblings, etc, make sure you send me their home and email addresses so they can get the necessary updates and info. Hard to believe it is already time to wish you a Happy Thanksgiving. Welcome to October and an update on Asto Wamah! Our weather in Columbia as of late certainly makes it hard to believe that fall has arrived. It has been feeling much more like summer. If you walked through camp today, you would notice very few differences (other than the buildings closed up and the rafts moored at shore) compared to when you last walked the paths. There are some leaves on the ground, but thinking back to the gypsy moth damage during the early weeks of summer, those fallen leaves do not seem to be out of place. Due to this warm and dry weather, we have had the opportunity to get some outside maintenance projects started and some even completed. The Hut closest to the cold water showers has a new roof and a good deal of repaired trim work. The poles on the Lodge’s lower porch have been sanded and painted. We are working our way across the front of the Lodge, painting, rescreening, and repairing the 5 doors. That work will eventually lead to a more attractive front façade. Our major project focuses on the D.C., the oldest camp building constructed in 1944. The lake-side wall has suffered from dampness, sun damage, and age and is now in the process of being replaced. Fall is our best time of year to do outside work and we are keeping busy. By the time you receive the next Blog, the dates for the 2018 season will be set. Early in November, all camp families will receive a postcard with the schedule and fees for the new season. If you know of someone who might not be on our mailing list and would be interested in that information, please send us his or her mailing information. We have partnered with a software company (Ultra Camp) that will be managing much of our “office work”. Registration, the sending in of health forms, collection of fees, etc. will be a bit different. It will be our task to help everyone understand the changes and navigate the program. We believe you will find this format easier than it has been in the past. More to come on that topic! Being well informed of the weather issues beyond Columbia, we are grateful for the tranquility we have been so fortunate to have had, and are thinking of all of you who may not have been so lucky. The following is a mid-month Blog. The photos from this past summer at Asto Wamah have now been posted on the website in the Photo Gallery. Hope they remind you of the fun you had and the friends you made! Now that the summer camping season is behind us and the daily blogs written by Shannon and Sloane (and others) are in the past, you can expect to hear from us at the beginning of each month until June when the daily news returns. We are sorry we missed September 1st by a day or two. We will try to be more punctual going forward. Since the last session finished on August 12th and Family Camp on the 26th, there have been some noticeable changes at Asto Wamah. To begin with it is VERY quiet. No laughing or shouting even at Gaga! No hum from the walk-ins. The cabins are all closed up, the clotheslines are down, and boats, canoes, sailboats, and stand-up paddleboards have all been put in a safe place. If you were to walk into camp today, the first thing you would probably notice is the empty waterfront. Here are two pictures that give you a view from the flagpole and from Little Dipper. This is our way of protecting the rafts during the possibly stormy and definitely cold months ahead. Columbia Lake will soon be drained down a few feet. We will give you updates on that in future months. Because the hustle and bustle are gone doesn’t mean things are not happening. Cabin 6 just received (a long overdue) coat of paint on Thursday. It is a great improvement. As the weather holds, there will be endless projects to maintain and improve camp. Hope the end of your summer included spending time with friends and family and enjoying lots of time outside. Hope you also remembered to share those awesome skills you learned at CAW, including being respectful and Remembering the Other Fellow. We are thinking of each of you as you return to your back-to-school routine. We trust your new confidence and independence will put you in a good place as you reenter the role of being a student. Look for the next blog near October 1st! The start of the 2017 season is now just 3 weeks away. Preparations are in full swing. The field has been mowed and cut back, the buildings are being cleaned and made ready, a truck-load of sand is on its way to the gaga pit, supplies have been ordered and are arriving daily and staff are involved with on-site and online trainings. On May 27th we welcomed enthusiastic families and campers to Open Camp Day. Close to 50 families visited to see what Asto Wamah looks like, meet staff and have questions answered. It was a successful event that generated a lot of excitement. I fear I have disappointed some of you with my failure to include pictures with recent Blogs. I am always looking for the unusual and fallen short. Last week I did see a rare sight, one I have not seen for years. The attached picture was taken close to the huts on the hill. If you look closely you will see three, pale pink Lady Slippers. There use to be large patches of Lady Slippers growing in the Asto Wamah woods. For some reason they disappeared. I am hoping these 3 Lady Slippers represent a come back for this wild flower. This is my last Blog entry until September. Beginning on June 25, the Blogs will be written daily by a staff member reporting on the activities and details of that particular day. Hope you will follow daily to keep updated and informed. As we enter the 108th season at Asto Wamah, we are looking forward to a spectacular 7 weeks where friendships will be made, new respect for the natural world will increase and life-long skills of respect and inclusion will blossom. Be sure to check out our April & May updates just in case you missed them. Now that May has officially arrived, the Asto Wamah camping season cannot be far behind!! With the traditional camp clean up day behind us, the grounds and buildings are ready for the fun and adventure that lies ahead. Clean up day 2017 brought a particularly enthusiastic and dedicated team of workers to camp. For the first time in eons, the staff was invited to take part in this annual ritual of removing leaves, spider webs, and winter dust. A total of 8, former and present staff arrived ready to help. They (Maddy, Janabeth, Emily, Emma O., Charlotte, Olivia, Kaitlyn K. and Colleen) along with 30 regulars (including Sue, Catherine, Chris, and Drew) have succeeded in transforming the vacant buildings and ignored landscape into a welcoming site where exciting and fun filled days will soon rule. May is always noted for the Saturday afternoon when we hold Open Camp Day. This year that will be on May 27th from 3 pm to 5 pm. There will be staff present to give tours of the camp and answer questions. Former campers who would like to help on the 27th are welcomed to participate. Open Camp Day offers a very important opportunity for first year campers to see the inside of a cabin, get a feel for the ‘campus’ and get to meet people they will soon get to know during their stay. We look forward to meeting many new camp families on that day. If your health forms are complete don’t forget to send them in (Camp Asto Wamah, 42 Route 87, Columbia, CT 06237 or Fax: 860-327-5618) by June 10th so they can be reviewed. A FAST PASS will then be emailed to those with complete forms who are NOT bringing any medications. Even if you are bringing meds, having your forms reviewed in advance will speed up the process on Check-In day. March was a very busy month at camp with lots of changes taking place. To begin with, Camp is looking a lot different today than it did a month ago. The level of Columbia Lake is rising. The rafts that were wintering on the lake floor (in the sailing area) are now getting closer to floating. Plants, like skunk cabbage, are pushing up through the dirt and making the woodland look more like spring. When the sun is out, it is providing more warmth than it has for some months now. Birds are numerous and at last the snow is about gone. Each day is looking more like spring, so the camping season cannot be far behind. Probably the most critical piece of preparing for the new season is the registration of campers. The process began in February and at this point is just about over. The only session that has openings is the 4th, an all-girls, 2-weeks session. Waiting lists are being formed for the full sessions and have in the past proved to be a very effective way to get a spot at camp. There is still a need for additional campers in session 4, so keep spreading the word! April will see the start up of the wells. Because our water pipes are on ground level, the water is drained before freezing weather arrives. Once the water is running there is lots of work to do to clean up from a long winter. It is at this time that major maintenance can be undertaken to ready Asto Wamah for the new season. 2017 will mark our 108th year of camping on Columbia Lake. A devoted and enthusiastic staff has been hired. All of them are excited to get back to camp and present a program that is challenging, fun and meaningful in a place where children and young adults can learn valuable life lessons and grow in positive ways. It won’t be long now! With only a few days left in February, we are looking at this month with great satisfaction. It is always our most active registration month, and we are off to a good start toward meeting our 2017 goals. There has been the perfect mix of first year campers enrolling with returning campers. A good number of staff and campers have told a friend/neighbor/relative/ classmate about Asto Wamah and encouraged sign-up. We are entering March with a healthy enrollment and yet there is room in all sessions for more. Please keep passing the word so that there will be NO empty bunks at Asto Wamah this summer! Thank you! Along with the camper registration, this summer’s staff is growing daily and we are seeing the return of many of the 2016 staff. We are excited that in addition to our awesome and multi-talented staff, we are increasing the number of counselors with the ability to teach the ukulele and other string instruments such as guitars. We are focused on adding more “fun” time activities to the afternoon. If you have any ideas, pass them on! With the snow having left the gaga pit, we are looking to add a good layer of sand there as well as in the ‘sand box’. Both areas were hot beds of activity last summer and we will make sure they are ready to go by the first day of Coed! After the last few days, it is difficult not to think that summer is right around the corner. Working outside at camp on 2/22, 2/23 and 2/24 it was very difficult not to assume winter is over and warm days will be the new normal. History tells us that Mother Nature is not done and we probably have another month or 6 weeks of cold ahead of us. Hope you are looking forward to the start of the new camp season as much as the staff and I are. Lots of preparation is underway. Supplies are being ordered. Repairs are in progress throughout camp. New campers are visiting. All is being made ready! Trust you are staying well and remembering the lessons learned at CAW!